iSpot.tv announced it ranked No. 171 on Deloitte’s Technology Fast 500™, a ranking of the 500 fastest growing technology, media, telecommunications, life sciences and energy tech companies in North America. 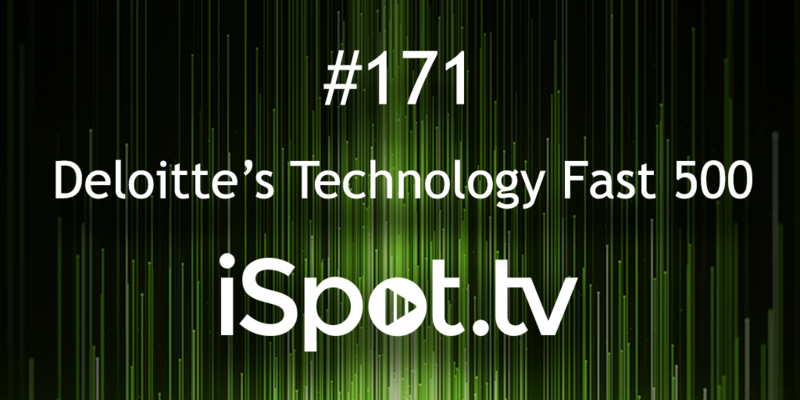 iSpot.tv grew 572 percent during this period. This is the second consecutive year that iSpot has appeared on the list since being founded in 2012.
iSpot is a real-time TV advertising measurement company that brings digital precision, transparency and accountability to disruptive brands. The proprietary platform provides a complete view of TV advertising activity across national, local, and OTT services, empowering brands to measure attention to creatives and connect ad exposures to business outcomes. iSpot offers a range of media measurement and performance metrics designed to help marketers make fast, reliable decisions and get a comprehensive view of the competitive landscape. Enhancing data from more than 9 million smart TV devices, insights from the iSpot platform are used for validating TV impressions, measuring creative wear, correlating exposure rates to digital actions and sales lift as well as predicting how best to reach actual customers. iSpot data can be easily integrated into first or third party DMPs and provisioned by brands or networks to agencies. Used by top advertisers in every industry to bring measurement in house, iSpot also works closely with most TV networks and conglomerates, including NBCUniversal, which uses conversion analytics to map ad exposures to business outcomes for its customers. The Bellevue-based company founded in 2012, was among the fastest-growing technology companies in 2017 and 2018 according to Deloitte, and its founder Sean Muller was named Pacific Northwest Entrepreneur of the Year in 2018 by Ernst & Young.